"As a seasoned design consultant, I have spent more than 18 years utilizing my creativity and attention to detail to design spaces that are as beautiful as they are functional. Closet Works gives me several options and products of the highest quality to create just what you need. From your dream closet, efficient office, or organized toy room, I look forward to working with you on all your storage solutions." As a highly experienced designer with a loyal following, Pam Zelke repeatedly fulfills clients' needs with outstanding designs that meet or excede expectations every time. 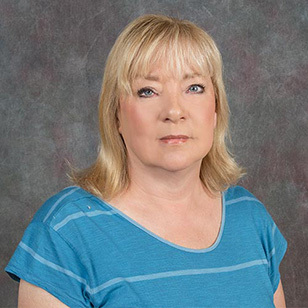 Pam is veteran closet design professional, having worked throughout the industry for many years. 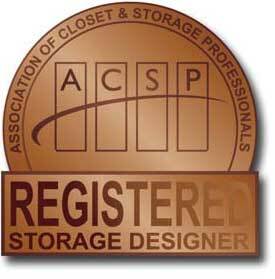 Her talent and achievements are recognized by the ACSP, having been awarded certification from the national Association of Closet & Storage Professionals — the industry's top professional organization. This multifaceted, upscale design is remarkable in quality and presentation. Fully loaded with luxuries such as the 360 degree spinning closet organization system and closet accessories like reeded glass doors, this is assuredly an opulent master closet design. 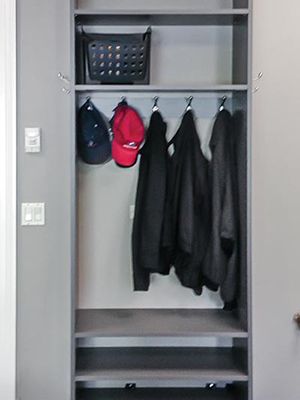 The 360 Organizer® by Lazy Lee® Valet model has been customized to suit the homeowner's individual needs through additional shelves instread of extra hanging space. The reeded glass doors in the wardrobe cabinet conceal hanging rods and shelves — perfect for keeping the room uncluttered, well-kept and stored clothing dust-free — hols evening gowns, tuxedos and clothing that is worn infrequently. The 360 Organizer® by Lazy Lee® Valet model consolidates shelves for shoes, folded clothes, and also drawers for smaller garments. 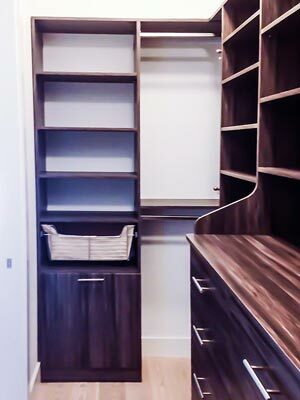 Employing a combination of floor based components like this closet hutch in addition to suspended pieces like the hanging units is often the best use of space in a custom closet design. This design contains all of the components necessary for ideal organization plus ample storage space. 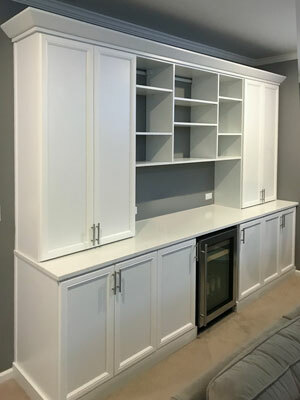 Beautifully crafted in unique woodwork, this custom closet system contains shelving, a double hutch with drawers and as much countertop space as a closet island, plus sets of hanging rods to hold the homeowner's large wardrobe of clothing. As a solution to conserve space, the shelves and hanging rods align with the corner of the closet while also maximizing storage capability. In this second view, there is a separate shelving section which includes a convenient pull-out basket, helpful for separating items for hand wash. Below the basket is the Synergy tilt hamper — dirty laundry is concealed from sight. Full bore panels in this system allow the shelving to be easily reconfigured as needs change. This entire design is flexible and comfortably spacious in its practical and thoughtful arrangement. Sophisticated and straightforward, this uncomplicated system accommodates effortless organization. Folded clothes can be placed on the various shelves whereas garments are hung on the rods. Storage is quick and painless in this satisfyingly simple design. Designing the system using a suspended rail system that anchors to the wall studs is a strong, timeless and also economical approach, which leaves the existing flooring untouched and is able to hold a lot of weight. The mixture of plentiful hanging rods and a towering shelving section are a winning combination for perfect organization. 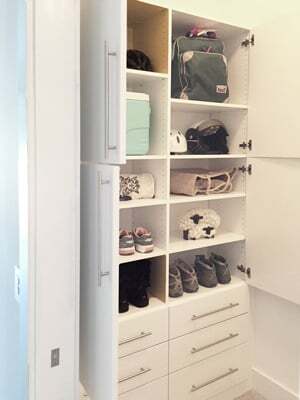 This system has enough space for an entire wardrobe, also including a collection of shoes. 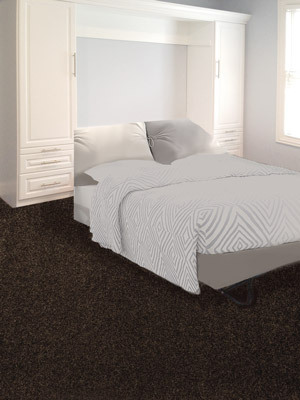 Finished in a cool Moonlight laminate, this unit makes the space peaceful and relaxing. Utilizing a suspended rail system keeps the design budget friendly as well as beautiful and functional. This dressing room is comprised of timeless features that mark it as more than just a traditional luxury closet system. 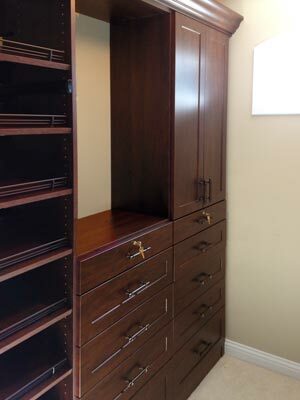 Slanted shoe shelves with shoe fences keep footware ready and accessible, locking drawers are perfect for fine jewelry and the additional drawers can easily replace the need for a separate dresser in the bedroom. The countertop and open area above is the perfect spot for a mirror or other personal touches. The rich cocoa laminate certainly adds a timeless elegance to the room. 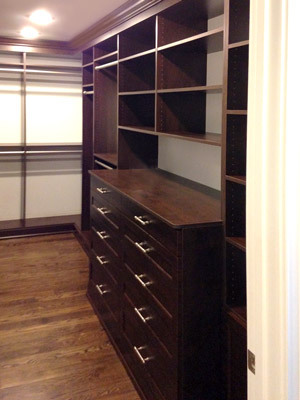 This master walk-in closet is beautifully designed with space conservation as a high priority. There is seemingly limitless capacity with its multiple hanging rods to individually categorize items into seasons or color. There are also shelves and drawers for ultimate organization capability. The bright white laminate lights up and opens up the space — and it never goes out of style. 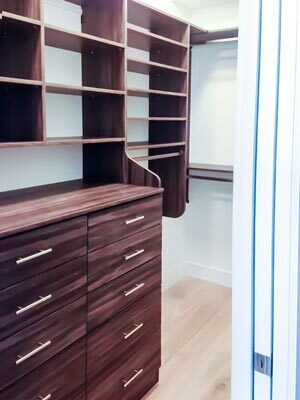 This reach-in closet design is pure and simple. 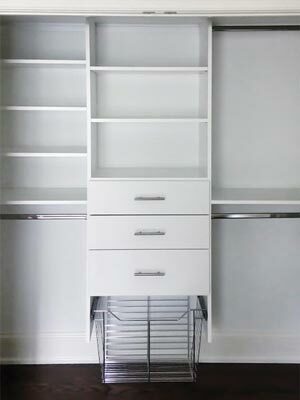 The unit is composed of two separate shelving sections, one for folded clothes, the other convenient for shoes. There are also drawers with a pull-out basket, which can be used as a hamper, below. The various rods are accommodating to a substantial amount of clothing that can be categorized into three different classes. 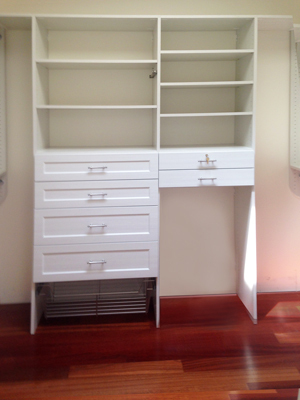 Finished in a white laminate, the unit looks voluminous for such a compact space. 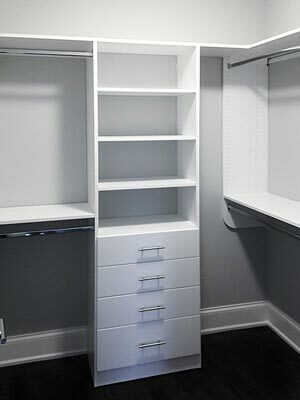 This small walk-in closet received an overhaul in organization, making the space much more functional. 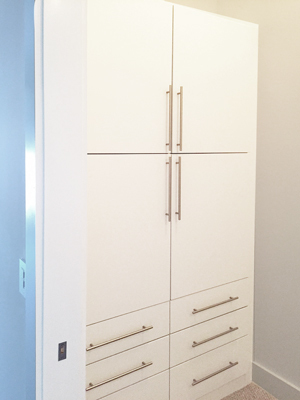 Designed in timeless white, the new custom closet system eliminates wasted space, increases available storage, and keeps everything organized and accessible. The use of several double hang rod sections, leaving only a small area for long hang items, can nearly double the amount of overall hanging space. 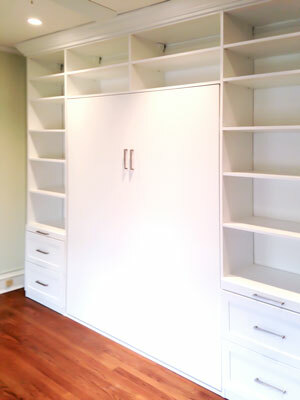 Most wardrobes only contain a small number of clothing items that require the full long hang space. The addition of a tall bank of shelves and drawers in the left corner ensure that this closet has a space for everything. As your child transitions to teenage years, their interests and hobbies expand which usually means more and more stuff. 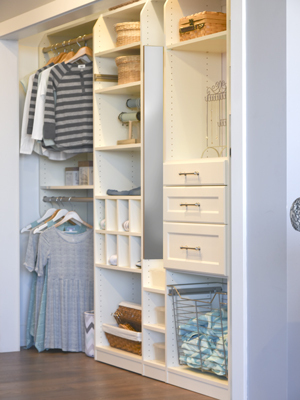 Having their own personalized reach-in closet will prevent messy rooms and promote taking care of their belongings. 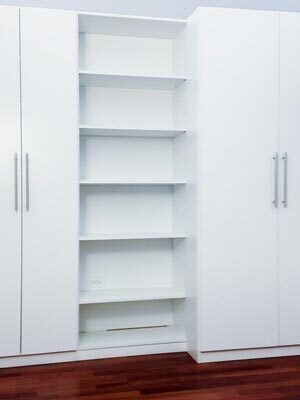 This organization system accommodates basic storage needs with hanging rods, drawers, and shelves but also includes features that are fitting specifically for a tween. A pull-out mirror, shoe cubbies, and a large wire hamper are all ammenities that make the most out of the space. 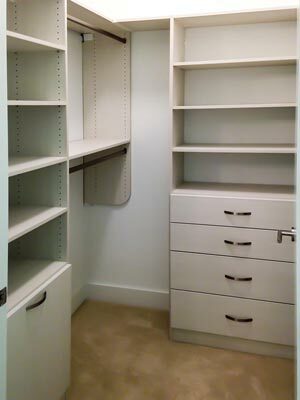 A Closet Design that Sings Organization: What a Diva! 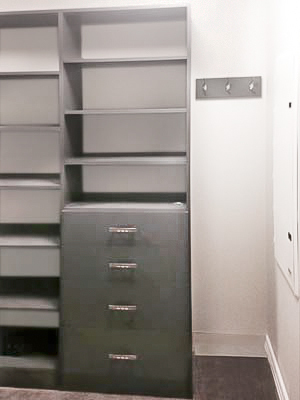 Pam designed this closet to lead the way in both organization and functionality. Employing a combination of floor based and suspended units in the design makes the most efficient use of the available space. 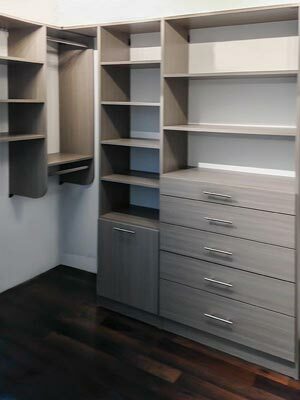 A combination of hanging, shelving and drawers ensures that this closet "has it all." Additionally, a tilt out double hamper keeps the dirty clothes hidden from consant view, but allows for sorting laundry by color right at the source. The light Diva bleached wood tone finish brings the whole closet together in a bright and airy design that is beautiful as well as efficient. 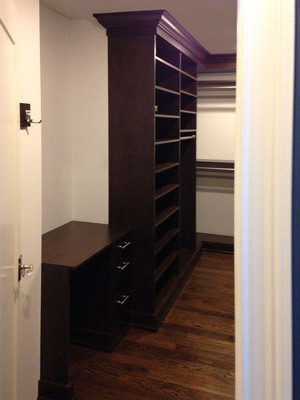 This custom walk-in closet design is customized to meet the homeowner's every wardrobe and organizational need. 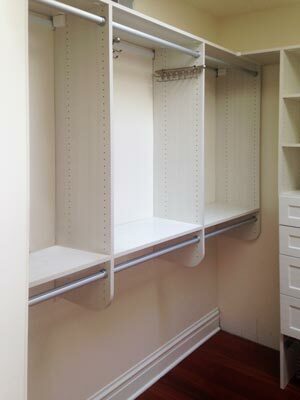 Two sides include a surplus of wide and narrow shelves that can easily accommodate a large sweater collection. Shelves are also great for storing folded jeans and casual pants. Drawers hold lingerie and small items, while multiple hanging rods keep shirts, jackets, dresses and dress pants wrinkle free. 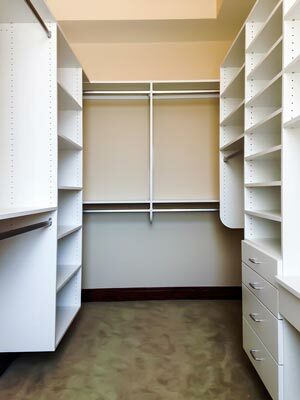 With a place for everything, there is sufficient space for separating clothing by use and season — struggling to find an item will never be a problem for the owner of this closet. 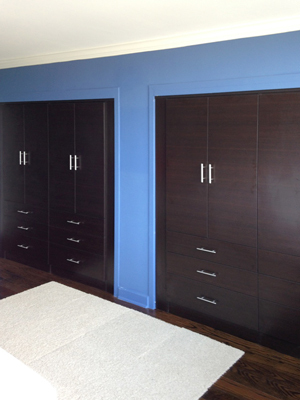 Wardrobes are masterfully designed for convenience, organization, and elegance. 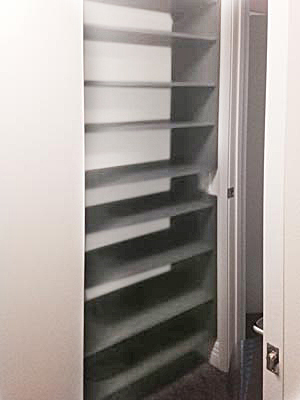 This unit offers the ability to walk right up and access clothes clear as day. The hanging rods enclosed in expansive cabinets and the array of drawers simplify storage for delicate outfits on hangers or folded clothes and undergarments. The combination of the rich African Walnut laminate with the vibrant blue walls is a sight for sore eyes. 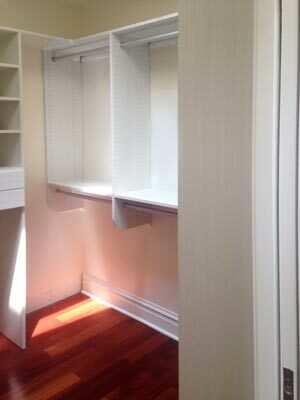 The organization system is also custom fit into an alcove in order to conserve maximum space. 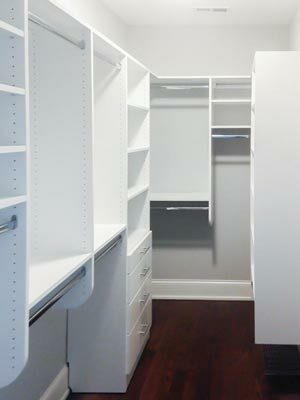 This closet system is a breath of fresh air with its combination of simplicity and a bright white laminate. The unit contains hanging rod sections to separate clothing into seasons and delicacy, drawers for folded clothing and undergarments, and expansive shelves for shoes or linen. An additional feature is the manner in which it wraps around the corner in order to conserve valuable space. This design offers the necessary qualities for effortless organization. Its drawers accommodate folded clothing and undergarments, and the shelves are ideal for shoes, purses, and other various belongings. There are additional hooks in an alcove of the wall for jackets, hats, or scarves. Shoes can be an obsession. So many shoes, so little space! In this case, an entire treasured collection can be proudly displayed on the high-reaching shelves. The dim moonlight laminate will enhance colorful shoes and make them stand out. Hanging clothes can be the preferred method of organizing clothing because they are easily accessible and rummaging is never a problem. This closet system provides four individual rods that are perfect for separating clothing by color, season, style, or occasion. This hanging rod framed shelf is an elegant addition to a closet. The Sienna Apple laminate along with the ornate structure are beautiful in concordance with its organizational purpose. 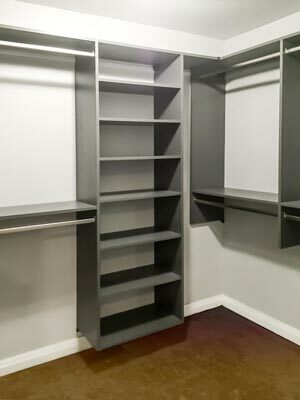 Stretching across the wall, this closet section exhibits storage capability with hanging rod compartments along with shelves and a belt rack for further organization. This simplistic can hold a multitude of clothing and keep everything in an orderly fashion. Pun not intended. 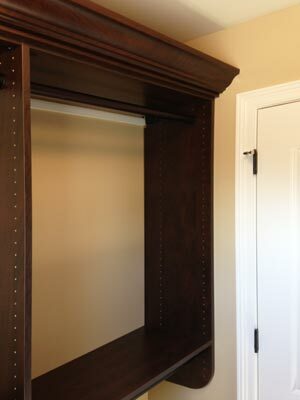 This closet provides sufficient space for all wardrobe pieces. There are hanging rods, tall shelves for shoes, wide and elogated shelves for purses and accessories, and drawers for folded clothing and undergarments. The River Rock laminate is soft, yet powerful. This closet system is easy on the eyes, and easy on the mind. Organization is made simple with multi-sized drawers and shelves for folded clothing, shoes, or purses. A special feature is a locking drawer where you can safely keep jewelry, a wallet, or the keys to your vacation home. A basket is down below to keep socks or like items such as a pair of slippers. And lastly, there is an open compartment suitable for a laundry bin or even a mini fridge. 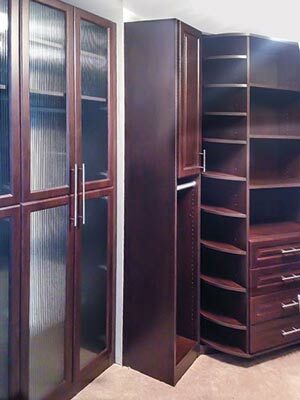 This closet organization system has a regal presence with its rich cocoa laminate and strong design aesthetic. With various hanging sections of different heights, clothing such as dresses and jackets may be separated from sweaters and blouses. A built-in dresser can accommodate a great deal of folded clothing along with the spacious shelves. The closet hutch is perfect to personalize with decor or put a jewelry tree. 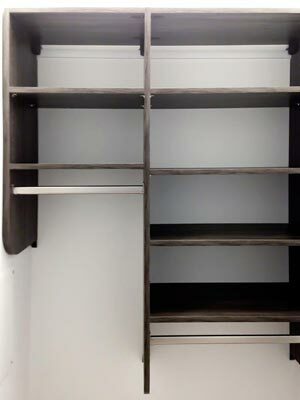 This view of the cocoa laminate custom closet displays its shelves for an entire collection of shoes and more pairs to be added. 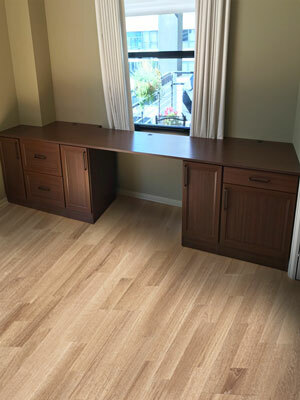 Also included is a simple desk to be used as a vanity with drawers for make-up and brushes. 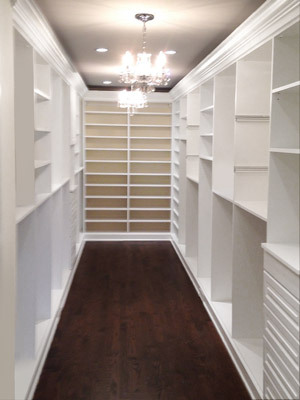 Pam designed this walk in closet to reflect beauty, functionality, and paid special attention to the owner's shoe collection. The entire back wall is devoted to shoe organization with shelves that stretch from the bottom to the top. 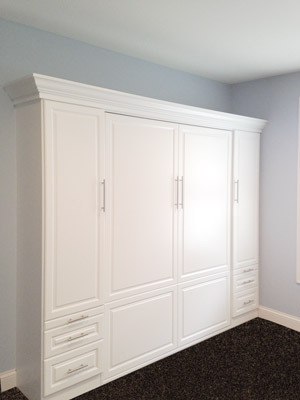 The elegant white organization system has Harmony door fronts for an exquisite, traditional look. Can a design be both modern and rustic at the same time? We think so and this farmhouse pantry closet design proves it! The basic structure of this pantry organizer system is designed with clean, white laminate using stainless steel hardware and accessories — definitely a modernist aesthetic. However, a strong feeling of traditional farmhouse warmth is injected through the use of accent pieces, especially the rustic style drawer fronts in Intrigue laminate. The simple style and weathered look of these drawer fronts evoke memories of a vintage family homestead. This smooth and sleek design is brimming with storage space. 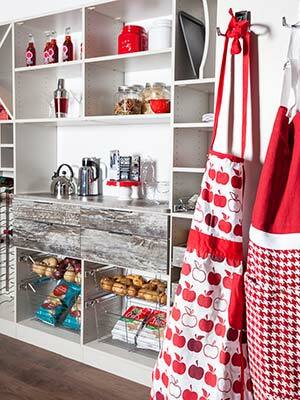 The high-reaching shelves centered between the commodious cabinets are essential for preventing a cluttered room. Items that may make the room look messy, like electronic equipment and wires, are kept out of vision in the sizable cabinets whiles books or cherished photographs can be displayed on the wide array of shelves. 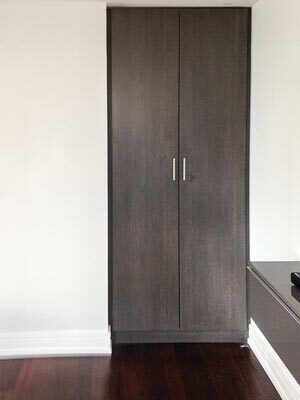 Designed to fit perfectly into a pre-existing nook with a finish that blends perfectly with the existing home decor, this tall, dark, and handsome cabinet epitomizes the benefits of using a custom built-in rather than stock solution. Sized to use every bit of usable footage in the home's recessed alcove, it is an excellent organization system, that doubles as a sharp and striking accessory to the home. The unit fits into its own compartment and mindfully leaves the room especially spacious. The cocoa laminate is tastefully complimented against the bright white walls. 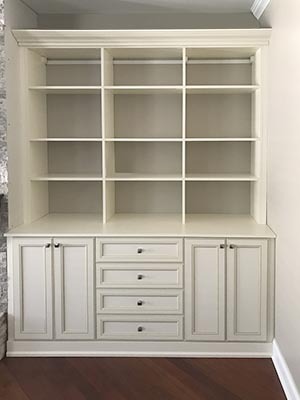 This wall unit gives all of the odds and ends a proper place and leaves the room cleaner than ever before. No shoes left out, no backpack thrown on the floor, purses put away, and more conveniences. Organization is a breeze in this thoughtful design. As you can see, this unit closes off with cabinets conceiling the array of personal belongings giving it a refined appearance. This beautiful design needs nothing more, nothing less. The cabinets are just what a family room needs for proper organization. All unsightly clutter and things such as movies, video game consoles, and games can be concealed in the smooth white laminate wall unit. An open countertop provides the perfect space for a potted plant to absorb the sunlight or display family photographs. 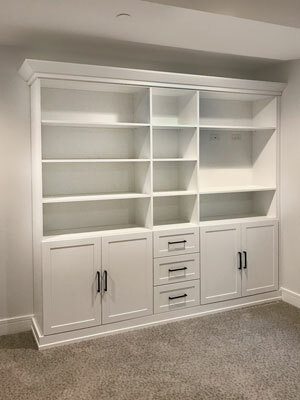 This custom wall unit gives the organization this basement was missing by providing a place for movies, games, books, and more. A tv will fit in the 24 inch alcove where electrical outlets are kept accessible. Portabella ivory is always a fine selection that reflects traditional values and a love for classic beauty. 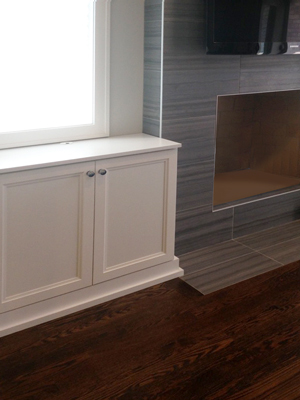 This wall unit surrounds the fireplace offering shelving for storage and decor. Alternating shelf heights of 12 inches and 16 inches allow for specific sized items to be placed in the varying compartments. This wall unit adds style and personality to this lower level space with a modern and clean charm. The design offers plenty of storage with unique shelving, spacious cabinets, and accommodation for a mini frige stocked with refreshments. A Snow Storm Silestone countertop gives this piece that extra touch of elegance and fine taste. Extravagant in design, but efficient in use of space, this room easily accommodates dual functions. Spanning an entire wall, the custom shelving unit and integrated Murphy style wall bed blend seamlessly into the room's traditional decor. The bed is unobtrusively concealed behind elegant cabinets, and is centered between a plethora of storage space. The shelves are perfectly accommodating for books and mementoes that add a personal touch to the room with photographs, books, decorations, or artwork. A pull-out bedside table installed on either side of the Murphy style wall bed is ready to become the perfect nightstand when guests arrive and the bed is put into use, but recede unoticablely into the bookshelves when the room is used as a study. Upholding a cool and contemporary feel throughout the entire condo, this home office design fits right in and also stands alone as a showstopping design with its fashionable features. The outstanding modern flair can be accredited to details including the unique Haze laminate, frosted glass inserts, warm LED strip lighting, and a peninsula desk on matte black legs. Working in a tight space can be troublesome. The same thing applies to when you are trying to relax by playing games or browsing the internet after a long day. This unit is refreshing and spacious with its wide open desktop, cabinets, drawers, and shelves that can accommodate any office necessities. The light reflects upon this white laminate wall bed unit eminating solace and comfort. A restful night's sleep is welcome by the expansive design in a clean and clutter-free room. The Murphy style wall bed includes an organization system of long cabinets and bedside drawers that accommodate nightly necessities and other personal belongings. The bed is concealed and the design is transformed into an elegant showpiece. The organization system is simple and the spacious drawers and cabinets come together harmoniously. This custom Murphy style wall bed performs as both a comfortable resting place for your guests and as a grandiose wall unit of luxury. The white laminate spans the wall, offering storage space for all sorts of books, photographs, candles, and more. Bedside items may be kept on the pull-out tables disguised handsomely as drawers. This home office design is in a warm, chocolaty laminate and spans the wall creating an expansive comfort zone to work in. 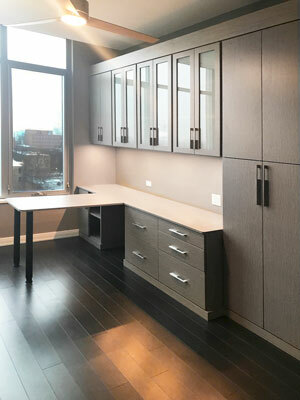 Oil rubbed bronze Square handles and Villa drawer fronts give this design a transitional and flexible aesthetic that can work with a variety of decor to personalize this custom home office space. Combining rustic and modern accents, this design transforms the space from ordinary to extraordinary. 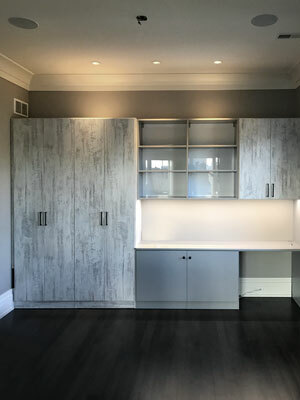 Custom Memento cabinets, frameless glass, Stylelite backer, strip lighting, and a built in desk are just a few outstanding features of this wall unit and home office combo. 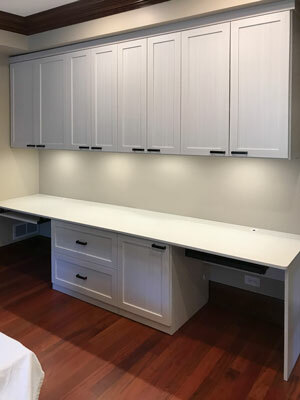 This home office is premium with a variety of outstanding details including the 5 piece Bella fronts used with White Chocolate laminate, the LED desktop lighting, and chosen hardware. The Metro style handles are used in an "out of the box" fashion with a horizonal application rather than vertical creating a unique, modern look. Also included are pull-outs for a keyboard and pencil tray. Garages are notoriously cluttered and a mishmash of tools, sporting goods, auto products, and truthfully, junk. This cool slate cabinet system is just what a family needs to organize and keep a garage looking clean and in orderly fashion. The unit is large, but not bulky as it fits compactly along the wall providing a slew of storage space. Before tracking dirt into the house or bringing a wet jacket inside, this unit allows you to neatly organize your belongings before entering the home. 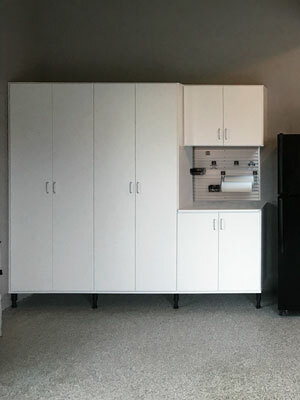 This garage organization system is in a bright white laminate for a spacious and soft look as compared to commonly industrious and masculine workshops. The expansive cabinets act as a stark constrast to the fridge creating an achromatic palette along with the grey floor. 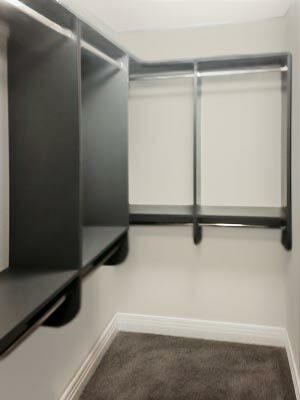 Mud Room Design Accommodates Each Member — including Fido! Home is where the heart is and everyone should have a warm welcome upon entering their house. 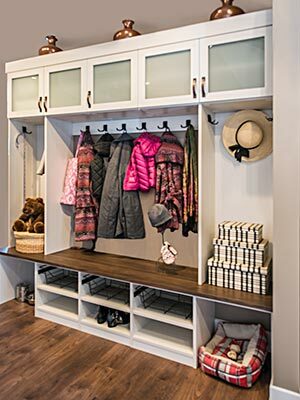 This mud room design does just that. 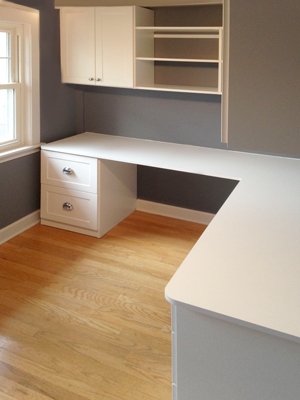 What a more perfect place for a high gloss Arctic laminate than a laundry room? The sparkling finish is synonomous with clean. The unit has been designed to fit two large machines like a glove under a spacious countertop for folding clothes and setting down detergent. 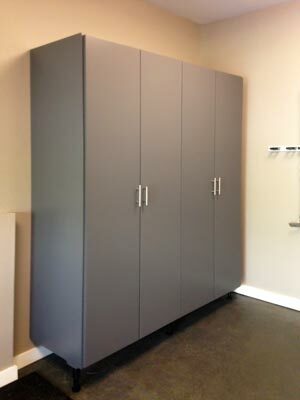 Cabinets are provided to safely keep chemicals out of harm's reach. 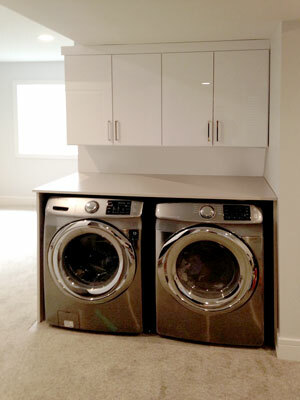 As you can see, the laminate shines and reflects, enhancing the fresh and clean atmosphere of a laundry room. 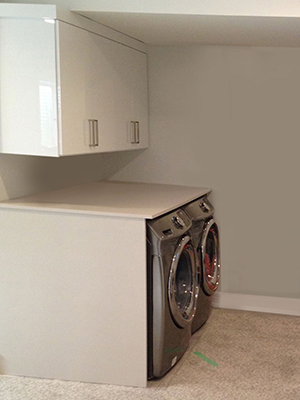 High gloss is a great way to transform your laundry room into a modern and stylish hot spot in the home. 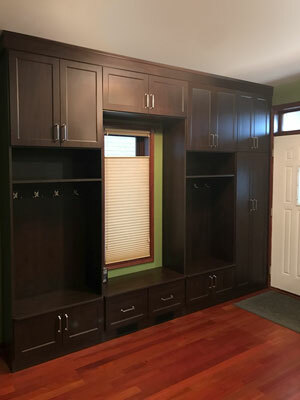 This mud room design is a proud display in its rich cocoa laminate with brushed chrome Emerald handles. 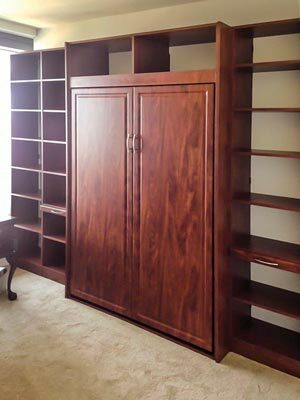 This unit provides the home with the perfect place to put all outerwear, shoes, bags, and more. Included are eight double hooks for hanging up jackets and bags and lower cabinets to conceal all shoes.